Derwent XL Charcoal combines the natural qualities of charcoal and traditional drawing colours with the strength and body of a chunky block. Derwent XL Charcoal is very opaque. Derwent Charcoal enables you to produce poweful lines to subtle gradients they feel soft, smooth and velvety, similar to a soft pastel. 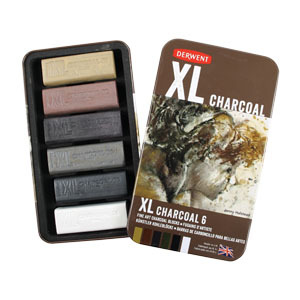 Derwent XL Charcoal can be layered easily over one another to create the perfect blend of rich tones and organic marks. Tin of 6 contains: 1 of each (block size 20 x 20 x 60mm) Derwent XL Charcoal Block Ochre, Sanguine, Violet, Sepia, Black and White.